Size: approx. 600 mm. Photo: 07/04/18, 11 am. Black bill, black legs, and yellow feet ... a snowy egret resting on our little dock. In the old days, the beautiful white plumes of this bird were in great demand as decorations for women's hats, which reduced their numbers to dangerously low levels. Now protected by US law, the population has rebounded. 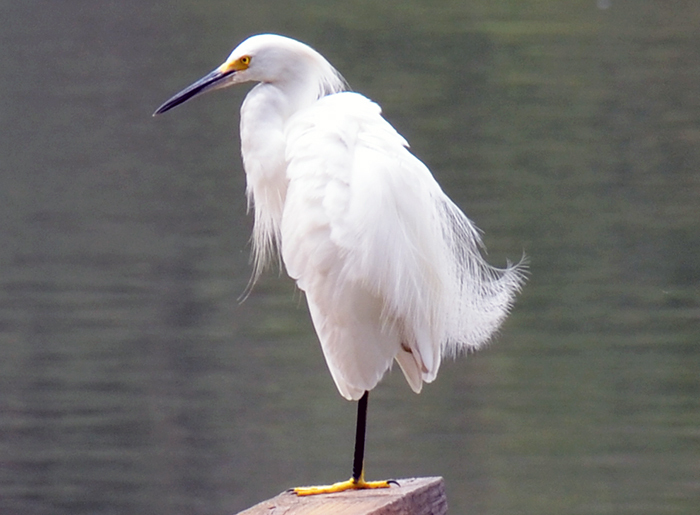 Snowy egret eat mostly aquatic animals, including fish, frogs, worms, crustaceans, and insects. Egretta caerulea (Little Blue Heron). Size: approx. 600 mm. Photo: 07/26/18, 10 am. Breeding adults of Egretta caerulea have blue-grey plumage except for the head and neck, which are purplish and have long blue filamentous plumes. The legs and feet are dark blue. The sexes are similar. 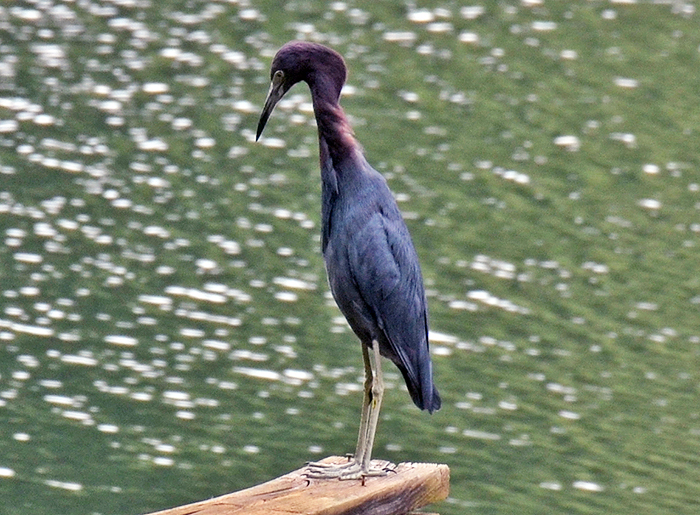 Non-breeding adults have dark blue head and neck plumage and paler legs. Young birds are all white except for dark wing tips and have dull greenish legs. These white little blue herons often mingle with snowy egrets.